Townsend Gut is a skinny piece of water that runs southeast to northwest from Boothbay Harbor to the Sheepscot River. 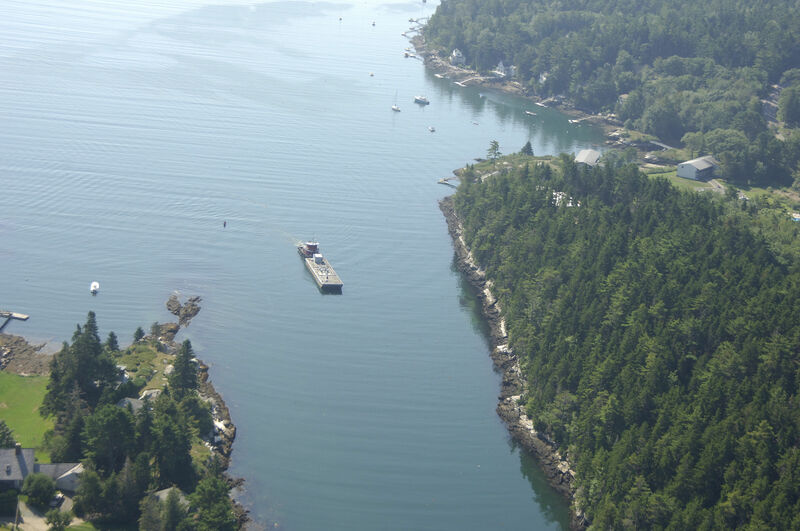 The image above is a view from the south-southeast looking north-northwest over the opening to Townsend Gut where it meets Boothbay Harbor. 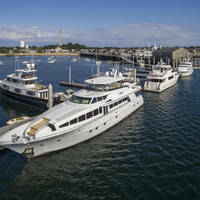 Townsend Gut allows travel between Boothbay Harbor and the Sheepscot River, which spares boaters from making the 10-mile journey all the way around Southport Island and Cape Newagen. 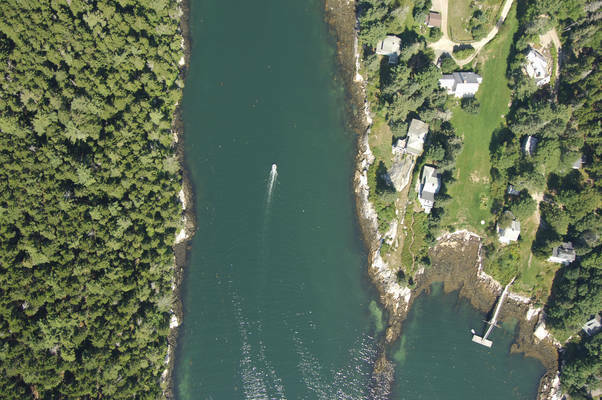 There are two approaches to to Townsend Gut: one via Ebencook Harbor to the northwest and one via Boothbay Harbor to the southeast. We will discuss both passages here. Two special navigation considerations before transiting Townsend Gut are negotiating the strong currents and clearing the state Route 27 swing bridge (located near the halfway point on Townsend Gut). Currents can run at velocities of up to six knots in Townsend Gut, so traveling with a fair current is highly recommended. The state Route 27 swing bridge has a closed vertical clearance of 10 feet and normally opens on request during the summer season. The northwest approach toward Townsend Gut involves a journey from the Sheepscot River through the northern portion of Ebencook Harbor, and then into Townsend Gut at Cameron Point. From the Sheepscot River, first set a course for the area near the following position: N43 50.348 W69 41.163. 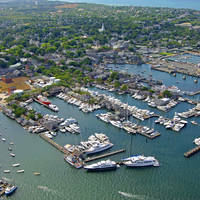 This waypoint will situate you just west of the passage between Dogfish Head and Green Island. Once you have reached the previously mentioned position, set a course of about 117 degrees magnetic for approximately four-tenths of a mile to intercept red nun buoy 2. After you have safely navigated to red nun buoy 2 (and left it decidedly to starboard), set a new course of 036 degrees magnetic to meet up with green can buoy 3 northeast of Green Island. 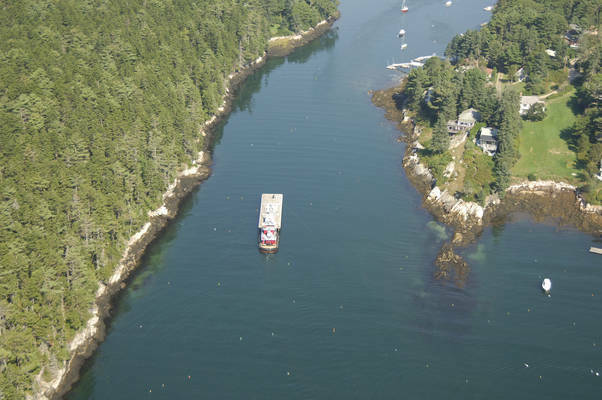 You have a choice of two routes when approaching the southeast end of Townsend Gut: one between Southport Island and Mouse and Burnt islands, or one north of Mouse Island from Boothbay Harbor. Either route is acceptable, it just depends on what direction you are coming from (south from Booth Bay or north from Boothbay Harbor). If you are arriving in the area from Boothbay Harbor, you need only set a course for red nun buoy 2, which is located at the southern entrance to Townsend Gut. Coming in from Booth Bay, first set a course for flashing red buoy 4, which is located at an approximate position of N43 48.968 W69 338.268. Having successfully navigated to flashing red buoy 4, set and follow a new course of approximately 000 degrees magnetic for around four-tenths of a mile until you reach red-and-green buoy BI south of Burnt Island--hence the buoy designation. The last step is to head north from red-and-green buoy BI between Southport Island to the west and Burnt and Mouse islands to the east. The only particular you need to be on the watch for is green daybeacon 1, which marks a small shoal east of Capitol Island. Once north of Mouse Island, set a course to pick up red nun buoy 2 at the entrance to Twnsend Gut. No reviews yet! 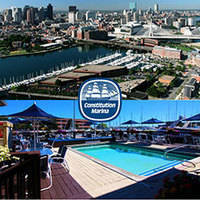 Be the first to write a review of Townsend Gut.